Assistant Professor of Politics Stephen Engel connected political compromise with the characteristics of a Bates education in his Convocation address. Photograph by Phyllis Graber Jensen/Bates College. 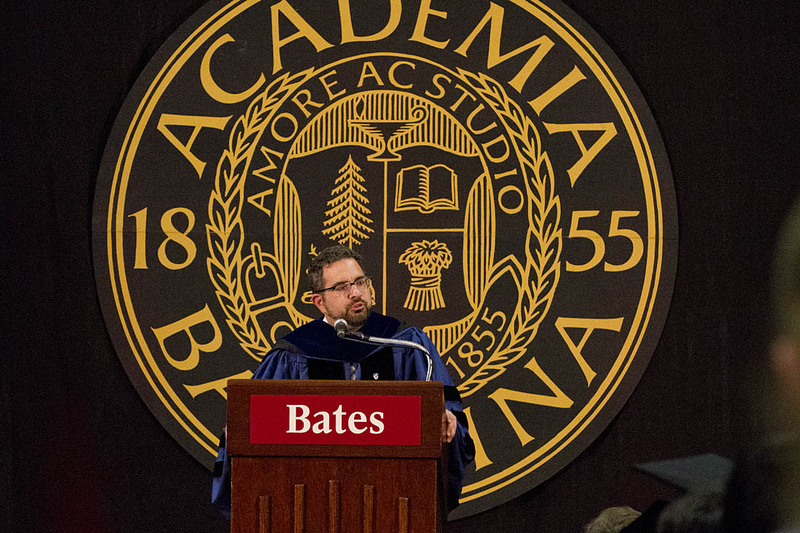 President Spencer, Dean Baker, Mr. Khan, honored guests, fellow faculty, administrators and college staff, and especially the Class of 2016, welcome to a new academic year for the Bates community. I am honored to offer some thoughts to mark this occasion and to commence what is sure to be a lively year in the history of the college. In particular, I ask whether and how its themes might intersect with the aspirations of a liberal arts education at Bates. Bates makes a promise to each of its students. It is the promise of a liberating education. What exactly do we mean by liberating education? Our history offers a clue. Founded on ideals of abolitionism and gender egalitarianism, the college has dedicated itself to cultivating ardent intellectual curiosity, rigorous analysis and informed civic engagement. We ground ourselves in this tradition, so that we can best prepare ourselves for the unexpected, the unfamiliar, for a future course that remains just beyond our sights. And, that future is particularly obscured this year. For this year marks a recurrent event in American politics: a plunge into the unknown also called a national election. This is when we subject our leaders to potential dismissal, when we avail ourselves of the opportunity to stay the course, tack in a new direction or offer no clear message at all and proceed seemingly without rudder. Our Constitution commits us to this ordered revolution; it lays out procedures through which we have successfully domesticated revolution for over 200 years. As a professor of constitutional law and American governance, I am in no small measure impressed by what our Founders and their successors achieved in establishing and maintaining the political architecture that permits peaceful transition of power. This is no small feat. And, yet our contemporary social commentators inform us that something has gone horribly wrong. That’s a troubling characterization to say the least, but it is not without merit. We are constantly reminded of how our politicians don’t listen to one another; they talk past one another; they demonize one another; they bicker over the insignificant and they pass the buck. Ironically, obsession with their own re-election prevents our leaders from governing because, as Gutmann and Thompson persuasively argue, governing requires compromise. And compromise is, by definition, antithetical to the pressures and, indeed, the very purpose of electoral campaigning. According to Gutmann and Thompson, the success of candidates for elected office depends upon “reaffirming their uncompromising commitment to core principles and on distinguishing their positions sharply from those of their opponents.” A “robust campaign requires candidates to treat their opponents as adversaries who must be defeated rather than colleagues who should be worked with” (p. 147). And yet, once that candidate is elected, once she is no longer the candidate but the office-holder, effective governance requires a very different mindset, a mindset of compromise, a mindset grounded in a willingness to sacrifice prudently some of one’s principles to get things done and to respect rather than demonize one’s opposition. Governing and campaigning foster and require different skills, but they also demand different perspectives. And the imperatives of campaigning have become ever more permanent in recent years, seemingly crowding out the space and time needed for our leaders to govern. The reasons for the rise of the permanent campaign since the late 20th century are myriad, and it is beyond the scope of my comments today to list and evaluate each. Nevertheless, I caution against romanticizing a mythic past of greater generations who allegedly knew how to govern better, more effectively, more efficiently and with more respect for one another. First, we would do well to note that our contemporary democratic polity remains more diverse, more open and more responsive than it has ever been. Second, let’s not forget that while our political present may be characterized by rancorous Tea Party rallies and Occupy protests, by paranoid congressional representatives accusing State Department officials of being plants for the Muslim Brotherhood, by members of Congress shouting that our president is a liar or not even eligible to be president, and by a House of Representatives calling for the repeal of the Affordable Care Act, which all three branches of our federal government have repeatedly affirmed as constitutional, our political past was not a bastion of compromise, cooperation and effective governance. Let’s remember that this is a country where in 1856 abolitionist Sen. Charles Sumner of Massachusetts was beaten within an inch of his life by Rep. Preston Brooks of South Carolina on the floor of the Senate, where after the tumultuous election of 1800, the governors of Pennsylvania and Virginia amassed their state militias 20,000-strong standing ready to storm Washington, D.C., to forcibly evict President Adams in support of Thomas Jefferson, and where President Andrew Jackson killed the national financial institution, the Second Bank of the United States, thereby threatening the economic stability of a fledgling democracy, even though all three branches had repeatedly held the Bank to be constitutional for over 40 years. What does this cooperation require? In part, what is needed is recognition of loyal opposition. That requires an understanding that political opposition is necessary for democracy to thrive, but more fundamentally that you treat your opposition with respect, that the loser in an election will observe the results and relinquish power, that the winner will not use his new found power to oppress the loser and that both will continue to compete for power in the future. In my own scholarship I suggest that the United States operated for some time, perhaps as long as until the end of Reconstruction, without a fully developed sense of the loyalty of political opposition. In your reading, Gutmann and Thompson suggest that this respect for opposition is presently eroding. They posit that the spirit of compromise, which is grounded in nurturing relationships of mutual respect, is undermined by how our campaigning for office has overwhelmed our abilities to put the powers of those offices to use. Gutmann and Thompson seek reforms that might re-establish the balance. Indeed, many of the reforms they prescribe are embedded into the values of a liberal arts education and are made manifest in the institutional infrastructure of a college such as ours. A college is not a legislature; we are not charged with producing laws and creating compromises that might better the circumstances of the body politic. Nevertheless, Bates is a place where you have the opportunity — indeed you have the expectation — of challenging each other and yourselves, of debating, of arguing, of instructing and of explaining. And, to do so successfully — to make good on the promise that the college makes to you — our community requires the very same foundation underlying the spirit of compromise, most notably mutual respect. The classroom — or perhaps we should not limit ourselves to the classroom because much of your Bates experience will be beyond the classroom walls — so the classroom, the residence hall lounge, the dining table at Commons, the late night coffee at the Ronj, the football team practice field or the theater rehearsal space are all environments that can only thrive in an atmosphere of mutual respect. But, what constitutes mutual respect? Let me start by being clear on what I think it is not. First, mutual respect is not a synonym for tolerance. Last year, the Bates student-acting troupe, the Robinson Players, staged an excellent production of The Laramie Project, a docu-play examining the aftermath of the killing of a young gay man, Matthew Shepard, in Laramie, Wyo. The play explores the principle of “live and let live,” a principle many of those interviewed by the original cast espoused as a guiding tenet of life in Laramie. Cast members, faculty, college administrators and Lewiston-Auburn community leaders participated in a panel examining this principle after the final performance. I was privileged to take part in that conversation, and I admit I had some difficulty expressing why I thought “live and let live” was an insufficient foundation on which to build a flourishing democracy and, more immediately, a strong, welcoming college community. Your reading this summer helped me to identify why. In other words, mutual respect, unlike simple tolerance, requires interaction; it comes only through building relationships; it requires trust; to be developed, it needs conversation. And, a liberal arts education, at its foundation, is a conversation. It is a conversation among students; it is a conversation between student and teacher. Second, mutual respect is not about speech codes; it is not about imposing ways of speaking to ensure civility. Indeed, when much of our media commentary bemoans the loss of civility and the coarsening of our contemporary political discourse, I think it very much misdiagnoses the problem, treating a symptom but not recognizing the cause. We don’t want just civility. What we have is not a problem of tone. Rather, we want respect, which is to say we want to be valued; we want to be heard; we want to be recognized. The ingredients for fostering the mutual respect necessary for democratic governance, namely time and proximity, are already evident in the Bates education. Gutmann and Thompson recommend lengthening the terms of legislators, particularly members of the House, to give them more time between campaigns. Doing so might give them the space to adopt a compromising mindset and escape the limits of the uncompromising mindset demanded by campaigns. Similarly, here at Bates you have four years — and while that may not sound like much, it is nearly a quarter of your life thus far! You have the time to explore new subjects, to engage new interests, to converse with new friends and teachers, and to figure out for yourselves how, what and why you want to learn. You also have proximity. Gutmann and Thomson endorse restructuring the congressional calendar to keep our leaders in Washington, D.C., three weeks out of every four, to provide them with living quarters in the same complexes and to outfit those complexes with common dining facilities and recreational spaces. To me, what they recommend sounds a lot like the Bates campus. Here you have shared living quarters — they are the residence halls like Parker, Adams and Page. You have the shared dining facilities in New Commons; and, you have shared recreational outlets in Merrill Gym and Chase Hall. In short, if Gutmann and Thompson are correct in supposing “Proximity facilitates collegiality,” (169) then Bates College has the potential to be one of the most collegial places on Earth. Gutmann and Thompson admit that democratic government — in so far as it can only be staffed through competitive elections — requires standing on principle. Yet, they also hold that this stance must be bounded, that it has its limits. For democracy also requires what they call mutual reason-giving, which is to say that it asks “citizens and leaders to treat their principles as open to change. In short, effective democratic governance requires the very same approach that the Bates education strives to inculcate: an openness to evidence, an eagerness toward meaningful debate, a readiness to re-evaluate and a willingness to converse with honesty and integrity. To put it differently, a liberal arts education rests upon the necessity — indeed upon the responsibility — of mutual reason giving. So what we at Bates ask of you, what we challenge you to do, what we give you the support to achieve, is that you seize opportunity to scrutinize the ideas and values you hold today, to test them against others and to listen intently to people different from yourselves. This responsibility of mutual reason giving does not require that you leave Bates College in four years with wholly different ideas, values, goals and worldviews than what you embrace right now. Regardless of whether you graduate with new ways of seeing or you have reinforced the ideas you hold today, you can leave transformed because, if you make the most of the Bates Promise, you will have accepted this responsibility of a liberal arts education. Finally, this responsibility requires that you take ownership over your own education. A key difference between the educations you have received to this point and what you have the opportunity to embark upon here at Bates is that here you build your education. You decide what and when and where and how to study. For many of you this is an exciting and perhaps a little scary proposition; it might make you a little uneasy. It requires that you defend your choices, that you explain your ideas and that you engage honestly, truthfully and earnestly with others in this community. In short, you must develop the courage to say “this is what I think, this is why I think it, AND I remain open to being challenged by what you say.” At Bates, you have the freedom to develop your ideas, to speak and to write with conviction and depth; but that freedom demands a simultaneous commitment to be responsible for the consequences of that speech and word, for the impact that your ideas and actions have on those around you. My hope for each of you in the Class of 2016 is that you take the responsibility of your Bates education to heart, and that by doing so, you build an experience here that measures up to the promise that we have made to you. And with that I say, welcome to Bates! 1 Gutmann, Amy and Dennis Thompson. 2012. The Spirit of Compromise: Why Governing Demands It and Campaigning Undermines It. Princeton: Princeton University Press.